About a month ago, I was talking to a friend who said she’d heard a rumor that The Flaming Lips were going to play in Taos this summer. I responded something along the lines of, “get out” or “not a chance” … but with a flash of fashionable profanity, no doubt. 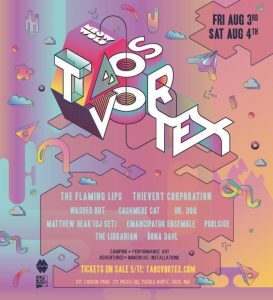 But lo and behold, yesterday came the announcement that Meow Wolf — the mind-bending art experience creators from Santa Fe — along with AMP Concerts and the Town of Taos will be hosting the Taos Vortex, a two-day indie rock festival in Kit Carson park, Aug. 3 and 4, featuring none other than everybody’s favorite freaks from Oklahoma (OK, they’re my favorite freaks from Oklahoma, maybe you have an Okie freak you prefer, that’s fair), The Flaming Lips. That alone would be a pretty big deal, but when you throw in D.C.-based electronica veterans Thievery Corporation, Philadelphia indie-psychedelia act Dr. Dog, electronica producer Washed Out (whose song Feel It All Around you might recognize as the opening theme for Portlandia), Matthew Dear, Emancipator Ensemble, Poolside, The Librarian, and Öona Dahl then you have a pretty major indie rock music festival happening right here in Taos. I for one am pretty excited about this revelation. In the time I have been in Taos, the Town has drawn some big-name acts to Kit Carson Park, including Dwight Yoakum, The Mavericks, Alabama Shakes, Widespread Panic and who can forget Mumford and Sons (pre-livetaos.com me was not impressed). You’ll notice that’s not an exactly indie rock group of artists, and if you read the Tonal Ranger column on a regular basis, or listen to my radio show on KNCE you’ll know that’s the stuff I like. 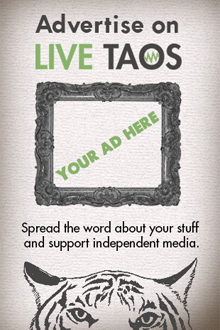 So, yes, I am excited about the Taos Vortex. 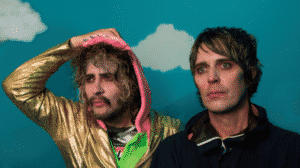 Never mind the fact that while I love The Flaming Lips’ albums (they are probably the most innovative studio band of our time), the one time I saw them in person I was a bit underwhelmed, because it’s hard to do what they do in the studio. Was it a spectacle when they released thousands of beach balls into a small club (Bimbo’s in San Francisco)?, absolutely, and I expect that the Taos Vortex, with its connections to Meow Wolf, will be an absolute feast for the eyes and ears. Personally, I’m excited for the implications of this event. Perhaps Taos can build on its legacy of being a great town for jam bands, reggae and country music, and add indie music to the list. Tickets go on sale to the general public at 10 a.m. on Friday the 11th for weekend passes including camping and late night dance tent ($199). If you want just weekend passes including late night dance tent ($149) and weekend passes with no camping and no dance tent ($99), you have to wait until 10 a.m. on Friday, May 18, and if you are just looking for single-day passes ($69), you take the chance by waiting until Friday, May 25 at 10 a.m.